This is the second release on ONYX from young Dutch mezzo and rising star, Christianne Stotijn. An outstanding collection of her core repertoire: the greatest Mahler songs from Des Knaben Wunderhorn (including Urlicht) and 2 Rückert Lieder, which Christianne sang under Bernard Haitink to such great acclaim in Paris and Amsterdam last year and which brought her to international attention. Accompanied by Julius Drake, one of the world’s outstanding accompanists who regularly records for EMI with Ian Bostridge and many others. Released to coincide with her PROMS debut in Mahler 2 with Bernard Haitink on September 6, 2006. Christianne’s debut recital (ONYX4009) ‘Phantasien und Traumgestalten’ earned rave reviews around the globe: “a really exciting event” (Gramophone) “easily the most impressive song-recital disc in years” (Philadelphia Daily Enquirer) “On what planet did she learn to sing so wonderfully” (Klassieke Zaken – Holland); Vocal Recording of the Month (BBC Music Magazine) “A new bright star in the singing firmament – (Wirtschaftwoche, Germany) and many, many more!! 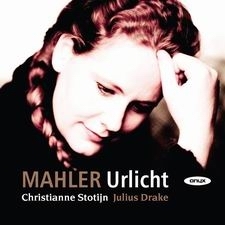 Christianne Stotijn here confirms the promise of her CD debut disc with an even better recital of Mahler. Her warm, rounded mezzo is a lovely instrument, marred just occasionally by an over-intrusive vibrato on high notes; and, throughout this wide-ranging collection, mainly from the Knaben Wunderhorn, songs of parted lovers and doomed soldiers, tender whimsy and religious exaltation, her characterisation is vivid and true. Stotijn is smiling and affectionate without winsomeness in those idealised Landler, Rheinlegendchen and Wer hat dies Liedlein erdacht, chillingly dramatic in the anguished mother-daughter dialogue of Das Irdische Leben. Most moving of all are the two final songs, Um Mitternacht, coloured by the deep, crimson glow of her lower register, and a rapt, withdrawn Ich bin der Welt abhanden gekommen. Here and elsewhere pianist Julius Drake is wonderfully imaginative in his one-man evocations of a Mahlerian orchestra. The young Dutch mezzo Christianne Stotijn proves herself an extraordinary Mahler singer with this disc of 15 Lieder. She imparts theatrical drama to the Wunderhorn songs, finding an impressive palette of tone-colour with which to illuminate the texts. She comes to each song with a freshness of approach that is as invigorating as it is unusual. There is no lack of humour in Rheinlegendchen while hte great set-pieces Urlicht, Ich bin der Welt and Um Mitternacht – are thrillingly performed, not only by the singer but by the pianist Julius Drake. This is the first recording to be made in the new Menuhin Hall at the Menuhin School, Stoke D’Abernon and the sound is splendid. One of my discs of the year, for a certainty. This splendid new Mahler release . [Stotijn’s voice is].. sheer joy.. full of wide-eyed childlike sense of wonder. judged, both artists’ colouration of these intensely personal songs highly sophisticated. Urlicht indeed! She’s Dutch, in her late twenties, and with a mezzo voice this expressive, flexible, and free of faults no wonder her star is rising. After her CD debut with Schubert, Wolf and Berg she plunges into the Wunderhorn Mahler of nature’s wonders, darkness and light, and soldiers trembling at midnight. The lyrical radiance of her Urlicht is typical; so is the attention to character in the narrative songs. Julius Drake’s piano cradles her skilfully. Hot on the heels of the young Dutch mezzo’s debut disc – warmly welcomed by Hilary Finch in the April issue – comes a Mahler recital of astonishing range and sophistication. Go straight to ‘Rheinlegendchen’ to catch the lighter essence of Stotijn’s approach: every word is coloured and inflected with natural musicianship, but never gets in the way of line or phrasing. Her rock-solid alto range is equally adaptable to the gruff sentinel of ‘Der Schildwache Nachtlied’, an unforgettable withdrawal to a private world in the last verse of ‘Ich bin der Welt’ and the calm assurance of ‘Urlicht’ (programmed here to follow an intriguingly steady treatment of the song which, reworked as the Scherzo of the Second Symphony, also precedes its orchestral incarnation). If there’s a fault, it’s that at the top of the range the vibrato can be tight under pressure, but characterisation overcomes it in the repeated ‘ades’ of ‘Scheiden und Meiden’. Like her pianist Julius Drake – a subtle impersonator of the birds, bugles and alphorns that haunt the naïve folk world of Mahler’s youthful forays – Stotijn makes every song a gem; it helps that the composer is always himself even in the early settings. The new concert hall of the Yehudi Menuhin School, making its recorded debut, lends warm support to the subtly varied recording.